Looking nice....I like the black look on it better also...I thought og making it with the vision baby tubs ,b but i believe they are too long.. Most of my other racks are black, so it just made sense! I have 1 white rack that sticks out like a sore thumb... Maybe I can find someone who will trade me for a black Oh, and Lowes carries various plastic shelving, I'm sure you could find a deeper shelf for a little bit more money. Could i use the Plano brand one? The Plano shelves (from what I've seen) are not suitable for this application as there is a slight indention in the middle of each shelf. Also I think the dimensions might be a bit off (the shelves aren't deep enough I think). 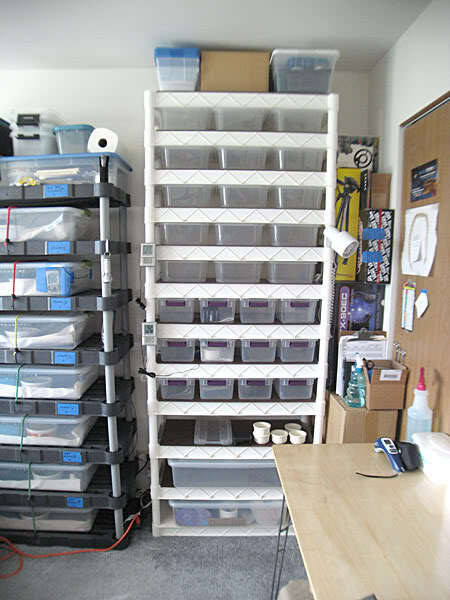 Then again if you're creative you might be able to get something together that works using the Plano shelves. I just completed this rack using the shelves from Lowes...if you can find those it's a breeze to build this. Thanks to everyone for passing this tutorial along! So can someone please tell me where i can buy or order properly sized tubs? I didnt find a sterilite that was similar to the kitty pans anywhere. Idk who skreptiles is, i have no affiliation! I found 10" x 14" x 4" tubs at my local Deals Store (a dollar store). I bought all my store had (about 36). They're an off-brand, but if I find them online I'll post a link here. BTW, the Plano shelves have 3 'ribs' on the underside of the shelves that extend about 1/4" beyond the flat edges where you would glue the eucaboard pieces. If you could somehow cut this protrusion down (it's somewhat thin and soft plastic) they would work and will be more sturdy than the Lowes shelves. I didn't have the time or energy to cut them so I returned the Plano units (bought from Menards hardware) and went with the Lowes shelves instead, which may not be around for much longer...my Lowes only had 4 white units and 1 beige, but the black units were a different style, without a raised lip and the shelves are grated/open. Looks like they're changing styles. I feared that this may happen. On the other hand you could always use eucaboard on both sides and cover the side that faces the tub openings with adhesive plastic shelf liner. I used shelf liner on my melamine rack and after 3 years I still have no warping! Once my rack's complete I'll post pics. I completed my rack, which ended up using 3 units, stands almost 7 feet tall, and will hold 3 adult tubs on the bottom, 12 baby tubs in the middle, and 15 sub-adult tubs at the top. Without heat, t-stat and tubs, this unit only cost me $98 to build! It was fairly easier to build, but was a bit tricky in adjusting the shelves so they fit just right. I found that it was best to make the leg-tube cuts at least 1/4" short, but a bit more wouldn't hurt. Why? Because the leg-holes have these plastic protrusions within which are meant to increase the plastic's friction to hold the legs in place. But the closer you get to the end of the hole the more friction they place on the legs, which makes it real difficult to adjust the legs in fractions of an inch so that the shelves lay across the tubs "just right" for smooth movement. I actually would rather cut the legs way short (1/2") and simply use screws for stops at the tops and bottoms of the legs, which I did for the bottom shelves since they have a lot more weight pushing down on them than the top shelves do...especially if you go as high as I did. Additionally, keep in mind that these shelves are manufactured under not-the-best-of quality standards...I had a few 'tops' (the turned-over shelves that serve at the tops of the tubs) that were ever-so slightly warped, making the middle tubs tighter than the ends. In those cases in order to move the middle tubs smoothly I had to loosen the space to the point that the end-tubs then slid past the lip-stop in the back. To account for this I simply placed large binder clips on the back lip at the point of those end-tubs. The binder clips then keep those tubs from sliding past the back of the shelves. Another option would have been to add felt adhesive pads to the bottoms of those end-tubs so they sit higher...but the binder clips are cheaper. I hope this info helps. If and when I need another rack I will make another of these...much, MUCH easier than melamine and they also look better!